The official website for the currently airing Tensei shitara Slime Datta Ken TV anime has announced that the release for the previously announced OVA will be postponed. It was originally announced to be bundled in the eleventh volume of the manga series released on March 29, but the limited edition of eleventh volume has been cancelled and the OVA will now be bundled in the thirteenth volume of the manga series, to be released this December. The reason behind it that the production team mentioned was "a problem with the progress on the production." 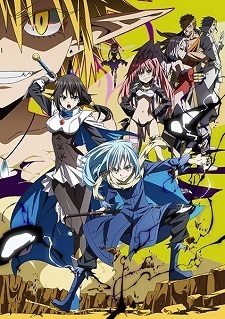 The currently airing anime series, which is based on the manga series, has been airing since last October and is planned for 25 episodes, where 23rd and main final episode will be aired on March 11, 24th and gaiden episode will be aired on March 18 and 25th and free episode will be aired on March 25. The manga is based on the light novel series. An exhibition is planned for March in Osaka and Tokyo. AnimeJapan 2019 stage for the anime will be held on March 24; Miho Okasaki (Rimuru Tempest), Makoto Furukawa (Benimaru), Asuna Tomari (Gobuta), and Chikahiro Kobayashi (Ranga) will appear for a talk show. An event to pre-screen 24th episode (gaiden) will be held on March 17; Miho Okasaki (Rimuru Tempest), Rina Hidaka (Millim Nava), Yumiri Hanamori (Shizue Izawa), and Sayaka Senbongi (Shuna) will attend for a talk show. The pace of the show is accelerating quickly — maybe a little too quickly. I do hope they take this time to slow things down a bit. We’re getting a 25-episode season and most likely a 2nd Season in the near future too, considering the franchise’s huge popularity, so a bit of production issues was due to come. It’s a bit disappointing we haven’t gotten a finalised date, or even the season of the year in which it will air, but hopefully it won’t be too long of a wait.